OpenGL which stands for Open Graphics Library refers to a multi-platform and cross-language API primarily designed to effectively render computer graphics. This API is mainly used in interacting with GPU with an aim of achieving more effective hardware accelerated rendering. Silicon Graphics, Inc. was responsible for the development of OpenGL and this is now greatly used in virtual reality, information visualization, scientific visualization, CAD, video games and flight simulation. What makes the act of using OpenGL programming remarkable is that it provides programmers with an interface along with graphics hardware. Other experts also define it as a widely supported and low-level rendering software and modeling package which is available in all types of platforms. It is suitable in a variety of graphic applications including CAD design, modeling and games. OpenGL programming is also considered as one of the most effective core graphics rendering option that are primarily designed for a majority of 3D games including Quake 3. It is capable of providing fully intentional low-level rendering routine and this is a huge help in allowing programmers to obtain greater flexibility and control in all his applications. You can also expect the routines to be easy to use especially in building high level and quality modeling and rendering libraries. The good thing about OpenGL is that it also serves as a good collection of numerous functions that are capable of providing easier access to all remarkable features offered by your graphics hardware. It also sets different essential aspects of your state machine such as lighting effects, blending and colors. 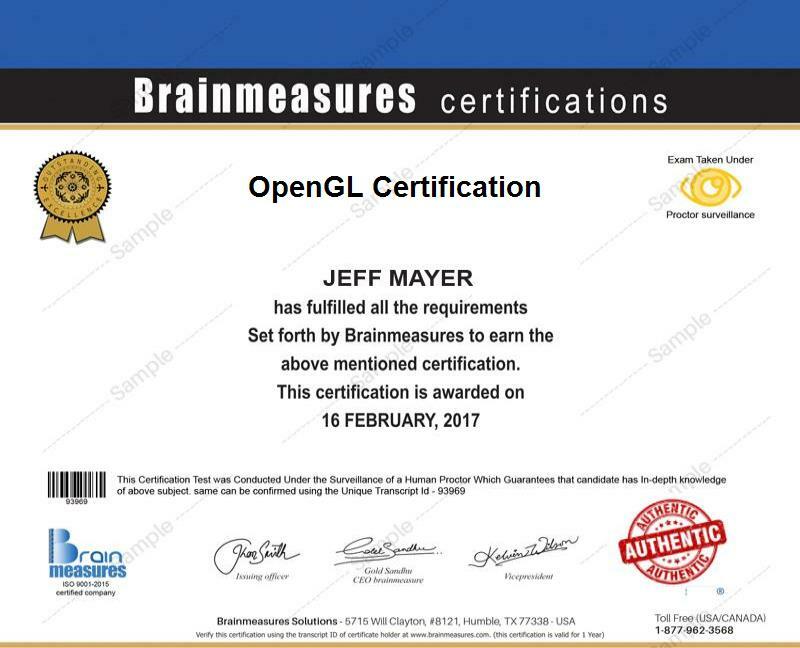 If becoming a certified OpenGL programmer is your major aim, then you should know that you can easily achieve this aim if you take part in one of the most popular online certification programs offered by Brainmeasures called OpenGL certification program. What makes this OpenGL course remarkable is that is filled with all the vital information that you wish to understand about this popular API. If you take part in this online certification program, then you will be able to give yourself the chance to enjoy the company’s OpenGL training which works effectively in your attempt to generate a more complete understanding about how this API works, its major functions and benefits, its most remarkable features and how you can take advantage of all them and the many things that you can do to use it in making all your programming tasks even easier to fulfil. Receiving an OpenGL certificate is ultimately rewarding because it shows the industry that you are one of the most skilful experts in this field. How to effectively force completion of drawing? How to display polygons, lines and points? How to enable arrays, perform dereferencing and rendering tasks and specify data designed for arrays? Enrolling in an OpenGL certification program especially that which is offered by Brainmeasures is definitely a huge help for all those who wish to understand everything about OpenGL programming. You can expect this certification program to be more suitable for all programmers, developers, webmasters and designers who wish to use OpenGL in performing all their programming tasks. Another reason why you should take up an OpenGL certification course is that it can help increase your income. As an OpenGL certification holder, working as an OpenGL engineer will become easier and this is a huge help in your attempt to enjoy a more stable salary which is usually around $102,000 annually. You can also work as an OpenGL developer which gives you the opportunity to earn up to $174,000 yearly.